Whether you make modern or traditional choices, enjoy the benefit of DJ Mr. Ed’s skill and experience to help musically plan your reception. Need music in more than one room at your venue? Common sense – uncommon music knowledge. Reading the crowd – a few steps ahead. Prepared, professional, tasteful and fun music service. Lightning-fast computer control panel & mega-library. From your elegant ceremony to adding atmosphere to your cocktail hour and dinner. Then, picking-up-the-pace to rock your dance party. Different parts of the reception call for different music. $200 off my wedding DJ service, if bride or groom is a member of the US Armed Forces. If the bride or groom is a member of the US Armed Services, $200 off my wedding music service. A small gesture with great respect. DJ Mr. Ed is awesome. Good mix of music and very friendly. Highly recommend booking his guy. (Groom) DJ Mr. Ed was really great!! He did a great job of pacing events like the father daughter dance, mother son dance, and our first dance. Also the music always reflected the mood of the wedding. He played great music for entrances, entertaining yet appropriate dinner time music, and fabulous music to party to! Perhaps the best aspect was how organized and available he was throughout the night. He followed out wants and directions without fail!! As a bride, it was comforting knowing that the DJ was not something I had to worry about. Just sit back and put on your dancing shoes. DJ Mr. Ed is fabulous! My wedding reception was at Turner Hill in Ipswich and he played just the right mix of elegant cocktail music and great dance music. Ed was the DJ at my sister’s wedding and I saved his contact information for years because he helped make her wedding was so much fun. He did not play any games or put on a show, he had great timing and kept the entire evening flowing – and most important, everyone had fun and danced the entire night!! A friendly personality combines with a professional work ethic to produce DJ Ed, a master of his art and an all-around good guy. He was a pleasure to work with and his presence put the finishing touches on our wedding reception at the Barn at Gibbet Hill. In our first meeting with Ed, we were struck by the passion he has for his job. His dedication to helping us prepare ensured that the entire reception flowed smoothly and served as a reflection of us as a couple. Ed isn’t the sort of DJ who puts on a show–he knows that his job is to create a tasteful atmosphere, which he seamlessly achieves. Although his skills as a DJ are impeccable, the real pleasure of working with Ed is his personality. Ed is the kind of guy that everyone wants as a friend–funny, honest, and sincere–while still maintaining a professional attitude. 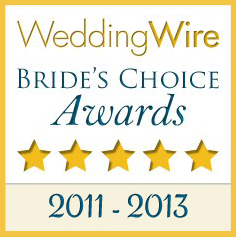 Even though our wedding took place more than a year ago, we still receive complements from our guests about Ed. At every wedding we have been to since, we find ourselves critiquing the DJ. None have compared to DJ Ed. Many of our guests told us that they had SO much fun at our wedding (and so did we!) – and a huge part of that had to do with the fantastic music by DJ Mr. Ed. We had met for coffee with Ed a few months before the wedding, gave him a sense of what we were looking for, and he was able to put together a play list that appealed to our friends and family of all ages. He also has a great website that gives his clients impressive control over song likes and dislikes (equally important!). At our venue, the MIT Faculty Club, Ed had set up two different speakers/sound systems: in one room for the cocktail hour, as well as the main room for dinner and dancing. The dance floor was PACKED all night thanks to the great selection of songs that Ed played. He also knew his audience well – he gave some specific shout-outs to the many teachers in the crowd (my wife and I both teach), as well as to the many friends and family traveling from my hometown of Cleveland for the wedding. We would absolutely recommend Ed to anyone who needs a professional, affordable DJ who listens carefully to what his clients want. It was an absolute pleasure working with him; he helped make our wedding day as amazing as it was! Interested in having DJ Mr. Ed Mullen host your wedding?